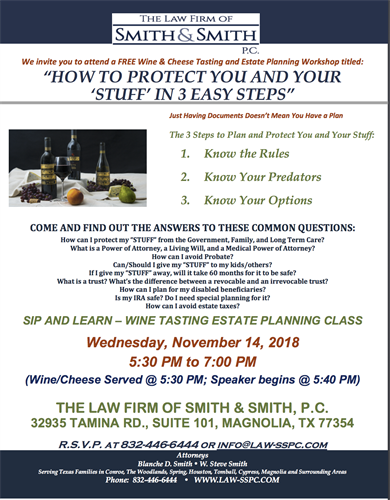 Community: Free Estate Planning Sip and Learn (Wine and Wills): "How To Protect You and Your 'Stuff' in 3 Easy Steps"
Name: Community: Free Estate Planning Sip and Learn (Wine and Wills): "How To Protect You and Your 'Stuff' in 3 Easy Steps"
Wine and Cheese Provided; Presentation description: In order to create an estate plan that will provide you with financial protection and mental peace of mind, you need to know the RULES, your PREDATORS and your OPTIONS. This class will discuss in detail what documents you need, how to put your "voice" in them, how they work, how to make them effective and how to use them to protect you and your "stuff" from predators and creditors such as the government, long term care costs, etc. 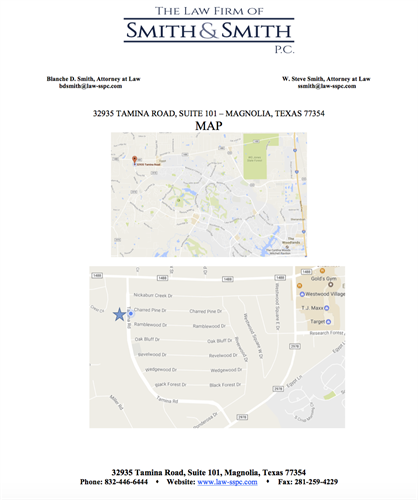 The Law Firm of Smith & Smith P.C.